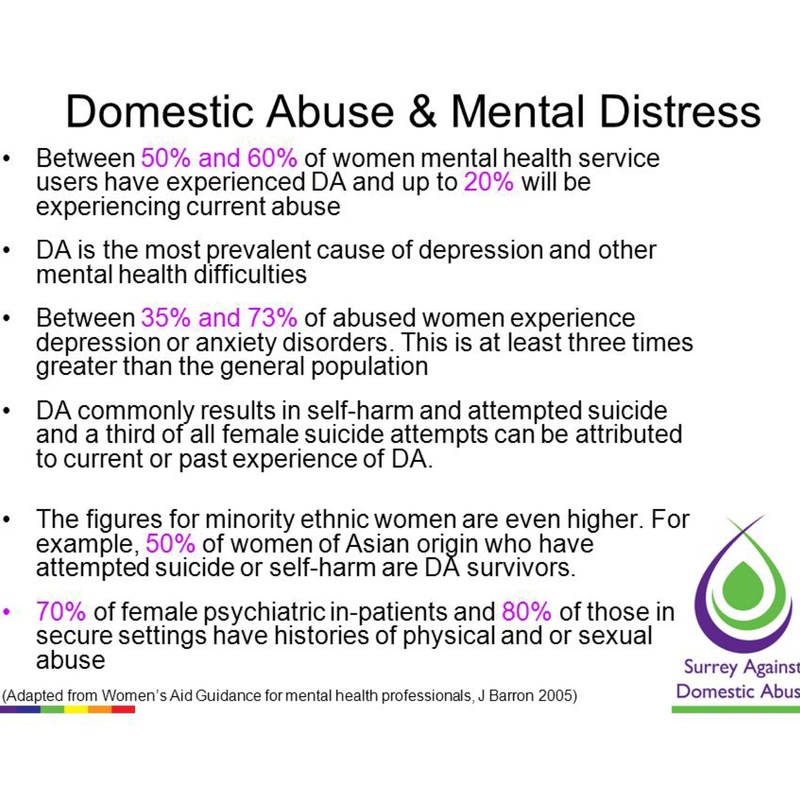 Between 50% and 60% of women mental health service users have experienced DA and up to 20% will be experiencing current abuse. DA is the most prevalent cause of depression and other mental health difficulties. Between 35% and 73% of abused women experience depression or anxiety disorders. This is at least three times greater than the general population. DA commonly results in self-harm and attempted suicide and a third of all female suicide attempts can be attributed to current or past experience of DA. The figures for minority ethnic women are even higher. For example, 50% of women of Asian origin who have attempted suicide or self-harm are DA survivors. 70% of female psychiatric in-patients and 80% of those in secure settings have histories of physical and or sexual abuse. (Adapted from Women’s Aid Guidance for mental health professionals, J Barron 2005) Perpetrators often use survivors mental health issues to their own advantage by; Controlling, selling or withholding. Hiding or moving objects. Liaising with professionals involved in the care of their partner. Telling the survivor that they cannot cope without them, that they are mad and no one will believe them.